The sports world turned its eyes to New York on Sunday night to see one of the all-time great New York Yankees, Derek Jeter, have his number retired by the iconic franchise. Jeter became the latest in a long line of Bronx heroes to have his number put to rest – fitting for a player who averaged nearly 138 games per season over 20 years in Major League Baseball. Jeter’s accolades are too numerous to list for these purposes, but they include 14 All-Star appearances, five Gold Gloves, five Silver Sluggers and five World Championships. He captained the Yankees through the great franchise’s turn-of-the-century renaissance and will be a guaranteed first-ballot Hall of Famer. He is the class of sports over the past decade, comparable only to names like Bryant, James and Manning over the past two decades. Peyton Manning is perhaps the closest comparison that can be made during their era, as both men not only excelled on the field, but also conducted themselves with class and as faces of their sport off it. No player in Denver sports over the last 20 years even comes close to a comparison with Jeter and Manning, but that doesn’t mean that there aren’t still some incredible athletes to have come through the Mile High City during that time – many of which may be deserving of having their numbers permanently retired. 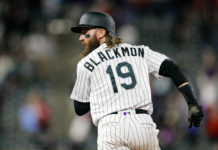 In this series, we look at which current or former Colorado athletes are the closest to having their jersey retired, and why they may or may not see their numbers hanging in the rafters in the years to come. 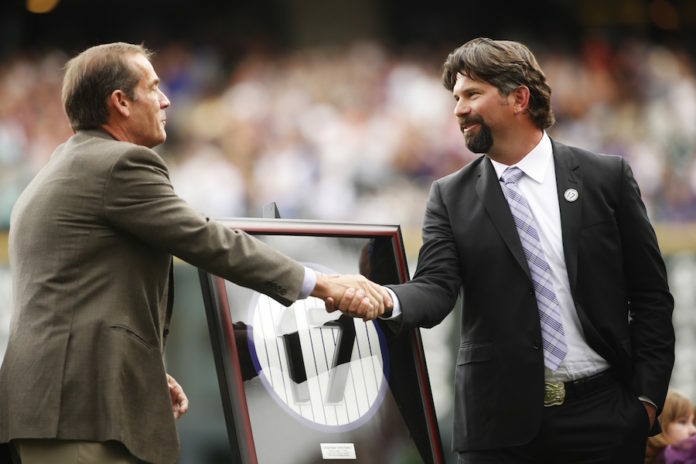 Todd Helton is the only Rockies player (not including MLB’s Jackie Robinson) to have his number retired, and rightfully so. For a franchise that is only in its 25th season, an appropriate 17 of them belonged to number 17. He’s the franchise leader in virtually every true offensive category (other than triples), and he’s atop most every Sabrmetric category as well. Thus, in 2014 the Rockies made No. 17 permanently his. The only player that consistently tops Helton in any offensive category is Larry Walker. The sweet-swinging lefty played 9.5 seasons in Colorado before chasing a championship in St. Louis. Over that time he managed to establish franchise marks in batting average (.334), on-base percentage (.426), slugging percentage (.618) and OPS (1.044). He ranks second to Helton in games played and nearly every other meaningful offensive category. He also ranks second in franchise history in triples and stolen bases. He was a five-time All-Star and won seven Gold Glove awards. He’s the only player in franchise history to win a league MVP. That fact alone should warrant his place alongside Helton, who never finished higher than fifth in MVP voting. 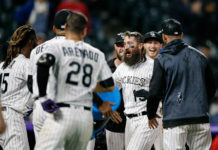 Had Walker played only three or four years in Colorado, you might be able to omit him, but the sum of nearly a decade as one of the best players in baseball should equal a spot on the facade at Coors Field for No. 33.